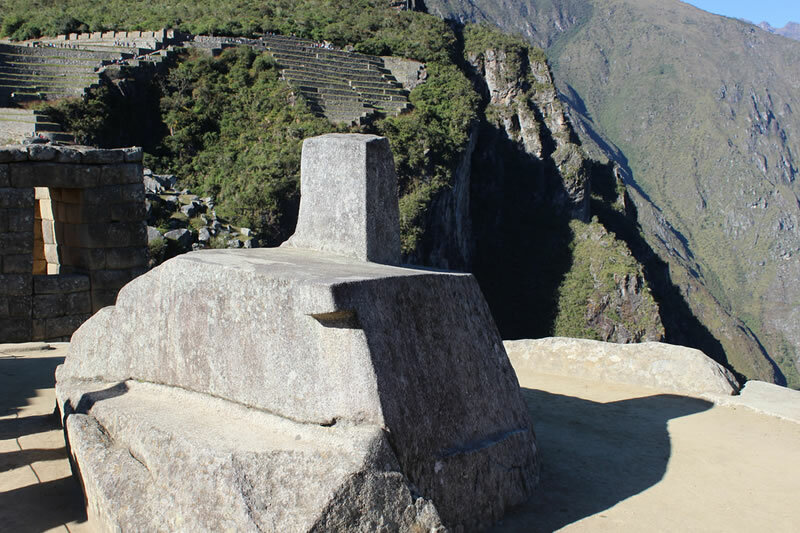 The Intihuatana "where the sun is tied" is a lytic piece carved in the shape of a polygon, which has a height of 1 meter and 2 meters in diameter. This work has many faces, planes and levels; at the top stands a cubic protrusion, whose faces are finely carved with beautiful cuts mathematically defined. It is a one piece in its different faces, casts shadows in relation to the movement of the sun and the different seasons. The lithic piece has a small staircase (to raise the priest) and a table at the top surely to put the offerings, all sculpture is oriented toward the sunrise; the Incas, from this place made observations and accurate measurements of the weather. They saw the exact repetitions of climate change, variations and thus determined the start of agricultural activities throughout the year, saw the movement of the stars and could calculate the time thanks to the shadow produced by the pillar carved in the middle. The Intihuatana is definitely a carved piece, with religious and astronomical purposes, was an observation point and precision. This block is located in the highest part of the Llacta Inca, accessed via stairs, carved in stone, the mountain whose summit is the Intihuatana, appears to be a truncated pyramid, surrounded by terraces containment walls and windows. Precedes the great "Sundial", religious enclosures, the Temple of the 3 windows, where would be located, the delegation of the priest and astronomer, who was responsible for measuring time. The entire assembly is in the area of Hanan or Barrio Alto, where they lived their tutelary gods, why are there best and most important buildings.